By default, when you create a custom panel, it will be empty, but we will learn how to fill it further. A newly created panel is as shown in the opposite image. A RMB click in an empty area of a customized panel will open the menu shown opposite. * Grab Current tool allows you to save your current tool with all its settings and connections: airbrush, penbrush, custombrush, etc ... This action creates a button in the current panel. The icon of this button is the one of the tool grabbed and it provides fast access to the previously grabbed tool. Note that the option to grab the current tool is also accessible by simply pressing the button of the Tool Preset Panel which is present by default. * Grab the current tool with colors has the same effect as the previous operation except that the tool is saved with the A and B colors defined at the moment of grabbing. 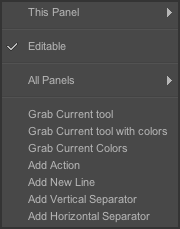 This option is also accessible via the button of the Tool Preset Panel. * Grab current colors and create a library of colors. * Add Action or series of actions (this part will be more detailed further in this lesson). * Add new line of icons to be filled. * Add vertical and/or horizontal separators between your icons (click with the right button on the latter to remove them ...). Note that the horizontal separators can be collapsed to save space. They can be named also, by a right click on the separator. Be careful : when you save a custom panel, the papers linked to your tools are not saved. In other words, if you decide to save a custom panel, only the brushes and their settings will be saved on your hard drive. This doesn't matter if you used the papers that are given by default with the software.